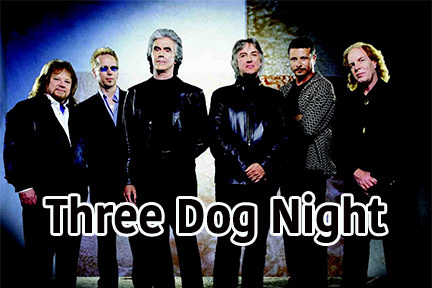 Three Dog Night scored a succession of 21 hit singles, including eleven Top Tens, and twelve consecutive gold albums from 1969 to 1975, thanks to the slick, sometimes soulful vocal harmonies of singers Danny Hutton, Chuck Negron, and Cory Wells and an excellent ear for quality material. While often criticized as commercial, the band was noted for its creative arrangements and interpretations, and their cover choices gave exposure (and royalties) to several talented songwriters: Nilsson (“One”), Laura Nyro (“Eli’s Coming”), Randy Newman (“Mama Told Me (Not to Come)”), Hoyt Axton (“Joy to the World”), Argent’s Russ Ballard (“Liar”), and Leo Sayer (“The Show Must Go On”). Wells and Hutton met in the ’60s while the former was the lead singer of the Enemies and the latter, a writer/producer for Hanna Barbera Records who had recorded several singles, served as producer. In 1967, Hutton conceived the idea of a three-vocalist group, and he and Wells enlisted mutual friend Negron. They took their name from an Australian expression describing low nocturnal temperatures in the outback (the colder the night, the more dogs needed to keep warm while sleeping). The three cut a few unsuccessful singles and decided to expand their range by hiring backing musicians, who included guitarist Mike Allsup, keyboardist Jimmy Greenspoon, bassist Joe Schermie, and drummer Floyd Sneed. “One” became the band’s first Top Ten hit in 1969, while “Mama Told Me (Not to Come)” hit number one a year later. “Joy to the World” became the group’s biggest hit in 1971, spending six weeks on top of the pop charts, and their streak continued with their final number one, 1972’s “Black and White” (a U.K. reggae hit for Greyhound), and their final Top Ten, 1974’s “The Show Must Go On.” By 1976, internal dissent arose in the group and Three Dog Night officially disbanded a year later. There was a reunion in the early ’80s, and Hutton and Wells have since taken Three Dog Night out on the international touring circuit. In 2002 With The London Symphony was released and then, in 2004, to celebrate their 35th anniversary, the band issued The 35th Anniversary Hits Collection which featured a pair of new tracks, “Sault Ste. Marie” and “Overground.” 2009 saw two more new singles in “Heart of Blues” and “Prayer of the Children” hinting at the possibility of another studio album in their future. Three Dog Night continued to tour over the next few years, though Wells eventually left the group in September 2015 due to medical complications. Just one month later he succombed to myeloma, a form of blood cancer.